I admit it, I’m a snob, but I don’t get the point of cake mixes. I mean, okay I do. 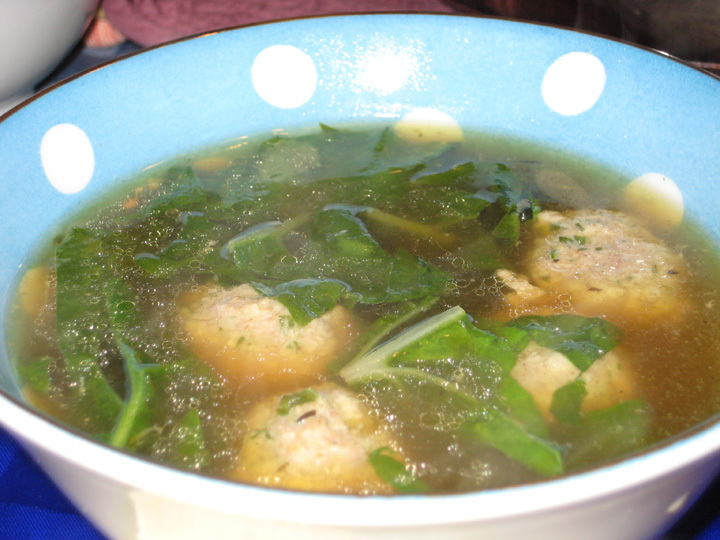 They’re cheap, convenient and simple enough that small children (or Sandra Lee) can make them without supervision. On the other hand, they also don’t taste particularly good. If I’m going to spend the calories on a piece of cake, I want it to be a really good piece of cake, and box mix and frosting from a can just doesn’t hack it for me. I once watched a food history show that talked about the development of boxed cake mixes and about how originally they’d actually dehydrated all the ingredients so that all you had to do was add water but the mixes weren’t popular because people didn’t feel like they were cooking. So, they tweaked the formula so that you have to add the eggs and butter/oil and stir and now people get to feel like they’ve been part of the process. They also showed the test kitchen for one of the big cake mix companies and talked about the lengths they went through to make sure that the process was as idiot proof as possible. What happens if you decide to beat the cake batter for twice as long as suggested? What happens if you only mix for 20 strokes instead of 40? What happens if you forget to add the eggs? It was impressive in a disheartening, despairing for the fate of humanity kind of way. Because, who can’t follow the instructions on the back of a box of cake mix? So okay, it takes 5-10 minutes to make a box cake mix and basically requires a bowl and a spoon. On the other hand it only takes 20 minutes to make a cake from scratch and also technically only requires a bowl and spoon, although I’ll grant you it’s a lot easier if you have a stand mixer. I know for a fact that it only takes 20 minutes to make a cake from scratch because I ended up having to make the cake part of Dinner twice in a row after our oven decided to have a fit of the vapors and failed to cook the first batch. Having to turn around and make a second batch of cake batter right after I’d finished making the first batch was annoying, but did neatly prove that it could be done in 20 minutes flat. Even including clean up the entire process came in at under 30 minutes, and that’s without a dishwasher. My point being, if it’s only going to take me 20 minutes to make the cake from scratch, and if I’m doing it in my kitchen where I have access to a stand mixer (because I totally get why when my roommate bakes cupcakes at the library for cupcake decorating programs with the teens she opts to use box mix), and if I therefore get to know exactly what’s going into my cake – butter, eggs, nothing that I can’t pronounce that’s been added to improve shelf stability, no food coloring (unless I’m making red velvet cake) or artificial flavorings – why would I opt to save maybe 10 minutes and use a cake mix? Plus, when it comes to chocolate cake, if I make it from scratch I know that it will actually taste like chocolate, instead of just being dark brown and tasting vaguely like chocolate was waved over it in benediction at some point. Don’t even get me started on the evils of frosting in cans – although, I will admit that I dislike 90% of all buttercreams, even those made with love and care from scratch, so frosting in a can doesn’t stand a ghost of a chance. In conclusion, I’m a snob and cake mixes only enter my house if they’re going to turn around and march out the door to be used on hungry teenagers who presumably are more interested in learning how to decorate a cupcake and get high on sugar than they are in how the cake part actually tastes. Apparently all the high fat content birthday wishes have been saved for dessert. If I were to say that I have made this salad once a week since I came across the recipe a month or so ago, I would only be exaggerating very slightly. I would say that this is my new favorite way to eat kale, except that would imply that I had an old favorite way to eat kale which is not true. This salad, however, is magic. Thinly slicing and massaging the kale breaks it down enough to be tender but not mushy or bitter, the pumpkin seeds have a lovely milky crunch, and the fruit gives it a nice bright flavor. Best of all, kale doesn’t wilt under salad dressing and you can keep this in your fridge for a few days and it will still be bright and fresh. Remove the ribs from the kale, stack leaves together and slice thinly to make ribbons. In a small bowl, whisk remaining lemon juice with the honey and lots of freshly ground black pepper. Stream in 3-4 Tbsp olive oil while whisking until a dressing forms, and you like how it tastes (you may need more or less oil depending on how much juice your lemon gives up). 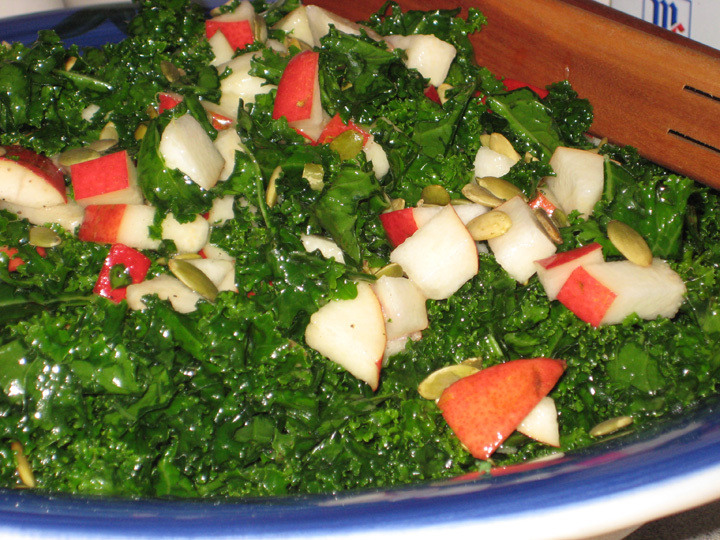 Pour the dressing over the kale, and add the mango and pumpkin seeds. Toss and serve. * I feel vaguely compelled to channel Spock here. A ‘bunch’ has variable definitions. A ‘bunch’ is unacceptable. Then again, I don’t actually have a better unit of measure, so a bunch it is. It will wilt down a little as you massage the olive oil into it, so slice more than you think you need, but remember that it’s not going to wilt down as much as it would if you were cooking it. ** I do this with whatever juicy seasonal fruit is to hand. Which is to say, I’ve made it with peaches, nectarines and pears. I think most fruits would work – pineapple would be good, figs would be interesting, a hard melon, plums. . . . I’m not sure apples would be as successful because they’re harder, but also probably wouldn’t be a disaster if that’s what was available. Mostly this is so I had an excuse to buy the goat cheese that comes drowned in honey and sprinkled with chopped almonds. This has a lot of steps, but is honestly less time consuming than it looks. 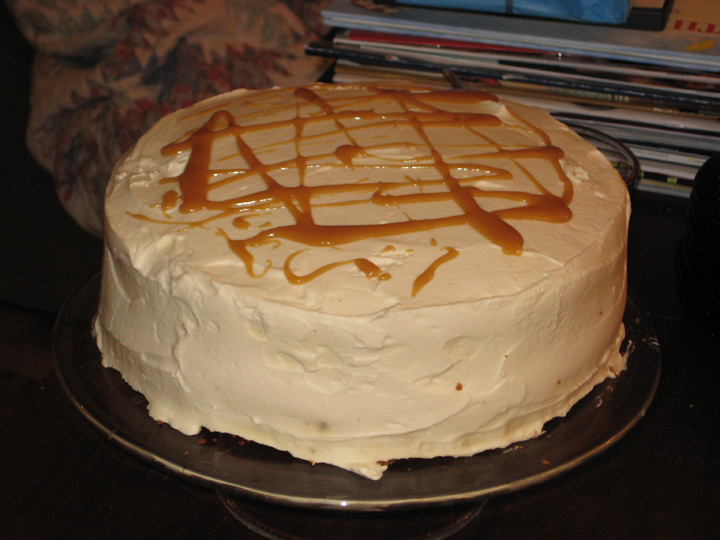 I spent about 30 minutes a night on it on Sunday (pecans & caramel sauce), Monday (cake – even making it twice only took a little over an hour), and Tuesday (frosting). Place lightly greased large piece of foil on work surface. Combine nuts and maple syrup in heavy medium skillet (do not use nonstick) over medium-high heat and bring to boil, tossing to coat. Cook until syrup is dark amber and almost cooked away and thickly coats nuts, tossing often, 3-4 minutes. Scrape nuts onto foil. Working quickly with 2 forks, separate nuts. Sprinkle with coarse salt. Cool until coating is crisp and hard, about 1 hour. Pecans can be made 1 day ahead. Store airtight at room temperature. Preheat oven to 350°F. Butter and flour two 9” cake pans. Combine first 4 ingredients in processor; add ginger. Blend until ginger is finely ground, about 1 minute. Using mixer, beat maple sugar and butter in large bowl until fluffy. Beat in eggs 1 at a time (batter may look curdled). Stir 3/4 cup hot water and molasses in small bowl. Beat dry ingredients into butter mixture in 4 additions alternately with molasses mixture in 3 additions. Divide batter between prepared pans (about 2 ½ cups each). Bake until tester inserted into center comes out clean, 30 to 32 minutes. Cool cakes in pans on racks. * Chinese five-spice has anise as one of the five spices, and some people really dislike anise, including the person I was making this cake for, so feel free to substitute cinnamon and nutmeg instead. ** I couldn’t find any light molasses, not even at Whole Foods, and I tend to think that if I can’t find it at Whole Foods it’s so obscure as to be irrelevant. However, before I went ahead and blindly substituted regular dark molasses for light molasses I plugged it into google to see what the internet suggested (what did we all do before the internet?). Apparently light molasses (which also goes by the alias Fancy Molasses, which sounds like a stripper name to me) comes from the first boiling of cane syrup. Dark molasses, which is what you commonly find in stores, comes from the second boiling and can be used more or less interchangeably with light molasses, although you’ll get a slightly denser flavor from the dark molasses. If you don’t really want that much molasses flavor and can’t find light molasses just use light corn syrup or golden syrup (Jen, correct me if I’m way off base here). Black strap molasses (Fancy Molasses’ older cousin who carries a gun and picks her up at the stage door after her shift to make sure nobody messes with her) comes from the third boiling and really shouldn’t be substituted for light or dark molasses, but can be diluted down to an approximation by using ½ black strap molasses & ½ light corn syrup in place of light or dark molasses. I have no idea what you do with it undiluted. And that was probably more than you ever wanted to know about molasses. Combine crème fraîche, cream, and both sugars in large bowl. Using electric mixer, beat until very thick and stiff. Melt butter in heavy medium saucepan over medium heat. Add sugar. Whisk until sugar melts and mixture is thick and boiling, 2-3 minutes. Gradually whisk in cream. Bring sauce to boil, whisking often. Boil until sauce thickens enough to coat spoon and is reduced to 1 cup, whisking often, 2 to 3 minutes (this took me more like 15 minutes – and like most things related to boiling sugar it’ll do nothing forever and then all of a sudden it’ll become caramel and from there it’s about 30 seconds from burning, so resist the temptation to walk away). Remove from heat. Whisk in coarse salt and extract. Can be made 1 week ahead. Cool, cover, and chill. * The recipe note on this says that you should resist the temptation to use real maple extract because weirdly the real stuff just isn’t mapley enough to have much impact, so you need to use the fake stuff to make it taste real. Personally, I couldn’t find any maple extract real or imitation, so I added ¼ tsp of maple syrup instead. I’m not sure that the maple flavor really came through, but it’s caramel sauce so it’s pretty tasty either way. 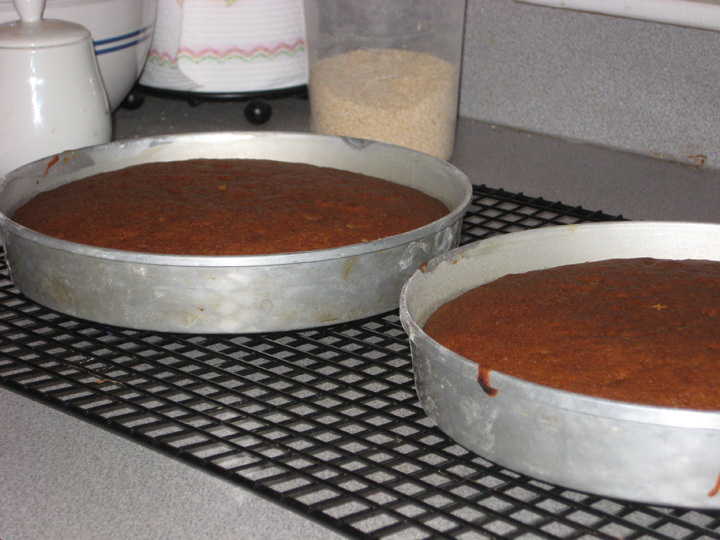 Cut around pan sides to loosen cake layers; turn out onto racks. (Hah! They make this sound so effortless. I had one layer that came out with much coaxing, and one layer that mostly fell apart on attempting to remove it from the pan – but this is why layer cakes are nice, you can cover all the flaws with mounds of frosting). Place 1 cake layer on platter. 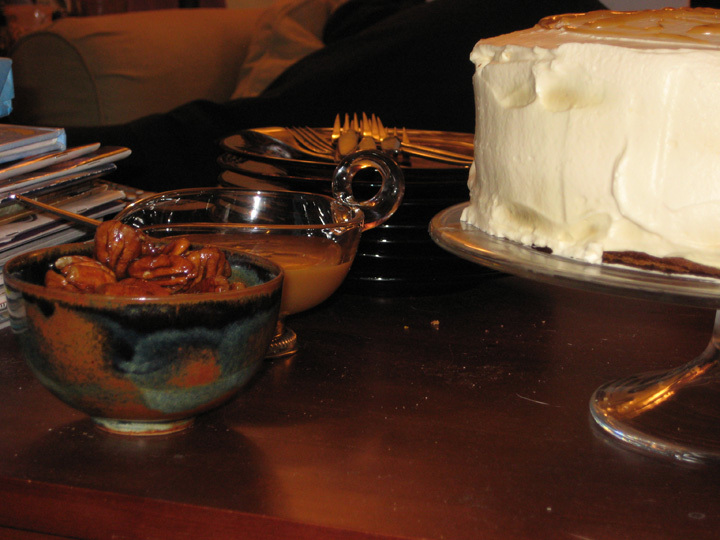 Spread with 1 1/3 cups frosting. Drizzle with 3 tablespoons caramel sauce. Top with second cake layer. Spread remaining frosting smoothly over top and sides of cake. 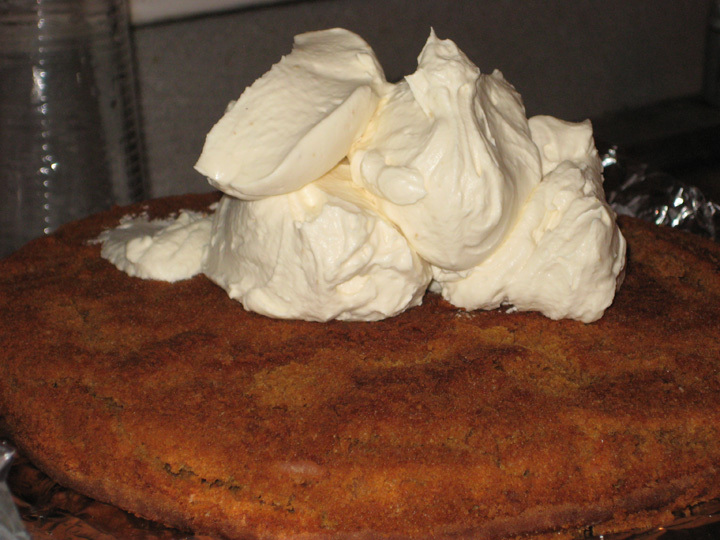 Drizzle top of cake with 3 tablespoons sauce. Cover with cake dome; chill at least 1 hour. Can be made 1 day ahead; keep chilled. Let stand at room temperature 30 minutes before continuing. 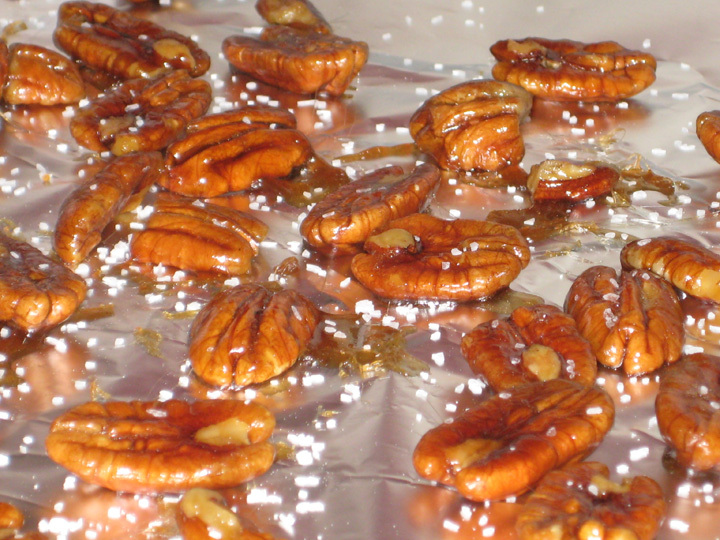 Cut pecans into pieces or leave whole. 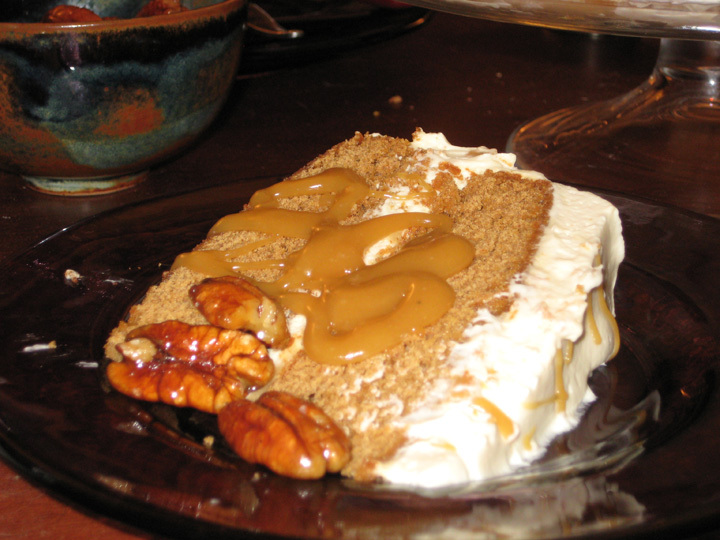 Press pecans into frosting on sides of cake (I served mine on the side for those who are allergic, or just plain don’t like nuts). Cut cake into wedges. Spoon sauce over. omg. this cake. THIS CAKE.